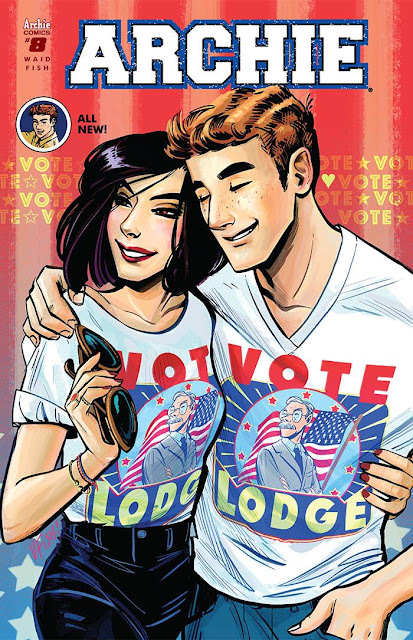 The struggle for Archie Andrews is real and getting on the good graces of Hiram Lodge has been nearly impossible. Such is life for Veronica Lodge's boyfriend who despite his best efforts is being undermined at every turn. What's a red-headed teenage clutz to do? Mark Waid balances the crazy shenanigans you'd expect in an Archie comics with some serious testing of Archie's character. It's a pivotal turning point for the series that elevates it from mere kid's play to coming-of-age drama built on family values. What Waid has been able to do with this rebooted series is remarkable, developing characters we thought we knew with added dimensions and emotions. On the surface, I had always considered Veronica simply a spoiled rich girl accustomed to getting her way and some of that remains but she's actually more complex than that. The way she fights for her relationship with Archie to her dad reveals just how much she truly cares for the dork. She's even seeing him secretly against her dad's wishes causing a deeper rift but forcing Hiram to try more extreme measures to keep them apart. It's pretty heady stuff for the Riverdale gang but it's Archie that has to make a big decision. Does he continue to date Veronica and jeopardize a big opportunity for his father or does he swallow his pride, lose her, and give in to the manipulative Mr. Lodge? Archie comes through swimmingly, standing up to Lodge making it clear where he stands while keeping his father in mind. It's a revelatory scene that shows maturity and character all the while exposing Lodge as the small petty man that he is. Waid continues to impress as he raises the emotional stakes in ways you don't expect in an Archie comic. The drama ramps up and sure there's some slapstick occasionally that adds laughs but 'Archie' has a heart, a mind, and a soul that makes it one of the best comics on the market. Veronica given an agency you didn't know the character was capable of, making her human and vulnerable even if you're rooting for Betty to get back with Archie. Veronica Fish is as dynamic an artist as there is and her versatility in managing the slapstick and the drama demonstrates why she was a fitting replacement for Fiona Staples. Her superb character designs and fluid scene staging never takes you out of the story. It's just the opposite, drawing you further into the emotional turmoil expressed on the faces of Veronica, Archie, and especially Mr. Andrews. The look on Archie's dad's face is a heart-wrencher. The color work by Andre Szymanowicz and Jen Vaughn is some of the best the industry has to offer. Seeing what Waid is capable of, moving Archie and Veronica beyond caricatures and more complex beings has me yearning to see the same done with other characters. Betty, Sayid, Sheila, and Maria could use more development and agency themselves. Waid has proven he can do it which makes me all the more excited to see what happens next. Fish is doing exceptional work handling the waves of emotions and humor with her art. There's never been a better time to pick up an 'Archie' comic.